John was born in Orange County and grew up in Fullerton with his good friend Dave. 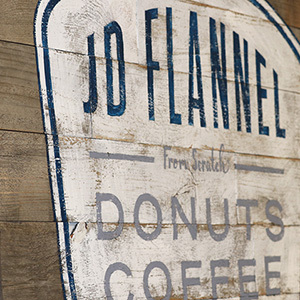 Before building JD Flannel Donuts, John spent five years as an officer in the U.S. Army and nearly 20 years in the financial industry developing leadership, investment, and financial experience. One of his fondest traditions as a child was driving with his dad to the local donut shop on Sunday mornings and picking out two donuts (usually a jelly filled and maple bar!) to eat prior to going to church. John has three children, Andrew, Emily, and Luke, and has been married to his wife, Susie, for 23 years. Dave is a native Californian and grew up in Orange County. Prior to his creation of and involvement in JD Flannel Donuts, Dave worked extensively in sales, marketing, customer service, and relationship management. He gets his love for coffee from his mom, being raised to enjoy a piping hot cup of black coffee on a hot summer afternoon! Dave is married to his wife, Kristen, and is a father to three children: Jake, Hannah, and Gracie. Lindsay was raised in San Juan Capistrano, and she began her culinary career at the young age of fifteen when she had the opportunity to shadow a chef for a school project at the Studio restaurant, Montage Laguna Beach. She soon became a regular shadow, spending every weekend watching and learning from the top chefs in Orange County. Within six months she was hired by the Montage where she worked and studied under top pastry chefs, Richard Ruskell and Louise Chen. After four impactful years of learning at the Montage, Lindsay decided to pursue her passion for music and studied Opera Performance and History at Utah State University. Little did she know, Utah State was one of the top Dairy Science Universities in the country! Upon her arrival, her personal cheese studies flourished. Lindsay continued to follow her culinary passions while in school, working at the Tree Room Restaurant at Sundance Resort in Park City and ultimately leading to working as a cheesemonger at the Oxford Cheese Company in the historic Oxford Covered Market in Oxford, England. After an amazing year in Oxford, Lindsay returned home to Southern California and continued her culinary journey in Los Angeles, CA, where she took to the kitchen again as one of the top 80 contestants on Fox networks hit television show, MasterChef (Season 7). After her time on the MasterChef set, Lindsay’s passion for professional kitchen work was reawakened as she expanded her culinary knowledge at The Resort at Pelican Hill and, most recently, Lifetime Fitness. Lindsay is a professional jam maker and an advocate for local, organic foods, often helping at her family’s farm in San Juan Capistrano.